Relaxing on the bed of the hotel this weekend, I had my feet kicked up, a magazine in my hand and Julia's family surrounding me. We're all sort of talking but after three days of sightseeing and trekking around Boston, it was clear everyone was just fine taking a few minutes to take in the quiet. Suddenly, a flurry of pitter patters and shrieking giggles booms throughout the room, and before you know it, 2-year-old Jack is climbing up on the seat and giving you kisses, holding your hand and using the Socratic method of questioning to get to the bottom of everything you say. I hardly ever spend time around little kids anymore, and I forgot just how hilarious they can be. On Friday night, we noshed on Lobster Rolls, Crispy Shrimp Flatbreads and Clam Chowder at Todd English's Olives. On Saturday we devoured amazing Eggs Benedict at The Salty Pig at brunch and sampled an array of Pulled Pork, Mediterranean Salads and Chicken Pot Pie at Johnny Harvard's Brewery for dinner. We had extremely fresh fish, scallops, shrimp and crab cakes at Legal Seafoods on Sunday. And we went through our fair share of coffees between the whole group. And wouldn't you know it, Jack had Cheez-Its, Cheerios and milk the entire time. The entire weekend -- that is literally all he had! But, I imagine, even the pickiest of eaters would have one of these brownies. In fact, I would almost guarantee it. Thanks Meg (and the Flour Bakery) for the recipe. They were some of the fudgy-est brownies I have ever had, and that is a good thing. Know that. 1. Position the oven rack to the middle and preheat to 325°F. Butter and flour a 9 x 13 inch baking pan. Gently melt the unsweetened chocolate and bittersweet chocolate in a medium Whisk in the melted butter and allow to cool slightly. 2. In a separate large bowl, slowly beat eggs and sugar for 1 minute, or until frothy and somewhat thick. Fold in the chocolate mixture. 3. In a medium bowl, sift together the flour, baking powder and salt. Fold in the flour mixture into the egg-chocolate mixture until thoroughly combined. Mix until there are only a few steaks of flour left in the bowl. This will ensure they will stay moist. Scrape the batter into the prepared pan and spread in an even layer with the spatula. 4. Bake for 30 to 35 minutes- but start checking at about 20 minutes. They are done when a knife or toothpick inserted into the center comes out with a few wet crumbs on it. Let them cool for 2 hours. They are so moist, they need this time to firm up enough to cut. 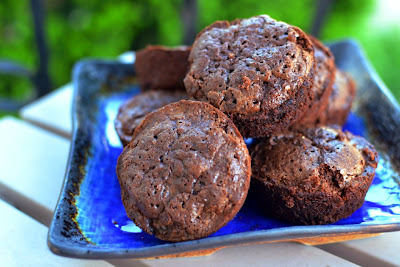 **Note: I made these in cupcake tins because I would have just kept cutting in the pan until there were no brownies left! I cooked them for about 20 minutes, but I think 15-18 would be ideal. Grease WELL! I love brownies. What a fabulous recipe. Looks delicious! Sounds like a delicious weekend! I'm all about intense chocolate anything and these look amazing! These do sound wonderfully intense. I really liked how you made them individual serving sized, too. Good call TammyJo... I ended up making them in cupcake tins because of portion control issues. I should note that!! Sounds like you had a very delicious time away!! These brownies sound decadent and delicious. I love a good chocolatey brownie! I love these brownies. They looks so rich and chocolaty:) CAn't wait to make them. Congratulations on Foodbuzz Top 9! Looks yummy! Congratulations on making the foodbuzz Top 9! these look wonderful!! Congrats on Top 9!! Your blog is fantastic! I just signed up to follow via Blogger...but my food blog is via WordPress (AnythingButPickles). My kids are a huge fans of upside cakes so we'll be trying some of your recipes for sure:) Oh, and congratulations on your Top 9 with FoodBuzz! I love a good fudgy brownie... I never thought to make them in cupcake tins, but they look so cute like that! Going to try it! These look fantastic, i think i might make them this weekend. BTW love you blog, it has inspired me to start my own with my SO.